- Scotland Yard Gospel Choir and The Steak House Mints at The Cubby Bear - Two great local indie pop bands. The Steak House Mints are one of Chicago's most recently formed indie bands to note, featuring the eclectic pop songwriting of front man Billy Dave Sherman. Their debut CD, "Out of the Sky," is a mix of Zombies-inspired melodies and clever power pop. Check out my full review of the album here. Doors 8 p.m., show 9 p.m., $8, 21 and over. More info. - Tiger Spirit, Village and Yuki at Darkroom - Pay close attention to Village, the new project from Steve Ucherek of The Living Blue, one of my favorite rock acts in the city in recent years. While that band is now inactive, they recently released a new album called "Walk, Talk, Rhythm, Roam" (reviewed here). If Village is anywhere near as good as The Living Blue, they'll be one not to miss. More info. 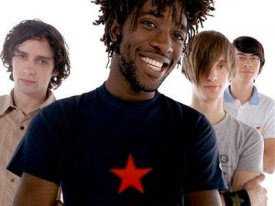 - Bloc Party with Longwave at Aragon Ballroom - Two indie rock mainstays in one show. Bloc Party released their third LP, "Intimacy," late last year, and Longwave released their fourth, "Secrets are Sinister." Doors 6:30 p.m., $27.50, all ages. More info and tickets. -Phil Angotti, The Handcuffs and Tiny Speakers at Quenchers - Triple dose of local rock and roll. 9 p.m., $5 donation, 21 and over. More info. - Blueblood, The Pack A.D. and Nones at Empty Bottle - 9:30 p.m., $3, 21 and over. More info and tickets.